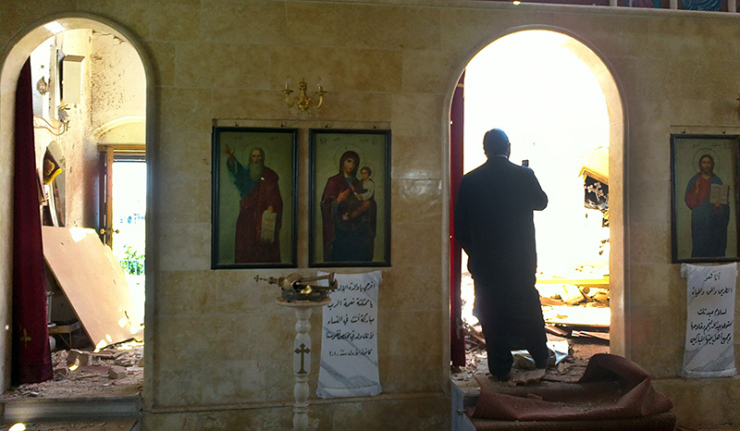 Persecutions of Christians by radical Islamists in Syria have acquired new forms. In the city of Ar-Raqqah in Syria’s north, members of the group “Islamic State of Iraq and the Levant” have stated that they would “grant their protection” to Christians only if the latter regularly pay render to Islamists and perform fewer Christian church services. Russia’s authorities are qualifying this as violation of basic human rights. After they have seized control over Ar-Raqqah, Islamists introduced there a policy that has already been practiced by Muslim authorities in captured areas with non-Muslim population centuries ago. They ordered Christians to pay a “tax” for their right of keeping to their faith – otherwise, Islamists do not guarantee that they wouldn’t kill them. The amount of the “tax” is from 1 to 4 dinars. Christians are not allowed to pray in churches, to build new churches or repair old ones, to wear crosses and other symbols of Christian faith, to drink wine, to eat pork and to keep weapons at home. Christian women are ordered to wear traditional eastern costumes, including headscarfs. In fact, Christians in Ar-Raqqah now have to choose between converting to Islam and being killed. Christians in Ar-Raqqah make less than 1 percent of the city’s population. The heads of various Christian denominations have been saying for already a long time that Syrian Islamists are leading a deliberate policy of repressions against Christians in their country. The head of the Russian Orthodox Church Patriarch Kirill for already three years has been calling on the world community to stand against killings of Christians only for being Christians. In 2013 alone, more than 70,000 Christians were killed in Syria, the Patriarch says. Last year, the Russian Orthodox Church sent several dozens of tons of humanitarian aid to Syria. Besides, more than 40 mln rubles were collected in Russian parishes to help Syrian Christians. The Russian Imperial Orthodox Palestine Society, which organizes pilgrimages of Russian believers to Palestine and which is, by the way, the oldest Russian nongovernmental organization, is doing much to help Christians in Syria. Together with the Russian Ministry of Emergency Situations, the Russian Palestine Society has sent 9 planes with humanitarian aid to Syria, including baby food, school utilities for children, canned food, water and warm clothes. In late February, the Chairman of the Russian Palestinian Society met with the head of the Roman Catholic Church Pope Francis. The Pope and other representatives of the Catholic Church from various parts of the world have also called many times on the warring sides in Syria to conclude a truce and not to kill civilians, and on the world community – to try its best to stop the bloody conflict in Syria and not to let it spread into other countries of the Middle East. However, unfortunately, the calls of religious leaders are not always supported by some politicians. Thus, recently, Syrian Archbishop Jacques Behnan Hindo openly said that Europe and the US are deliberately ignoring the facts of repressions against Christians in Syria. What’s Happening in the Ukraine Is a Tragedy for All: Interview with Metropolitan Nikoloz (Pachuashvili) of Akhalkalaki and Kumurdo. EU and gay marriages: Old World giving up Christian roots?